220 participants from 23 countries enjoyed 52 talks at the 5th FOKUS Media Web Symposium. Fraunhofer FOKUS thanks all speakers, guests and event partners for your contribution to and participation in the 5th FOKUS Media Web Symposium 2015 in Berlin. Following our tradition of providing a platform for international technology experts, distinguished guests presented and discussed latest developments of web technologies and up-and-coming trends during tutorials, workshops and a full day conference. With this year's motto »Web of the Future for the Creative Industry – Technologies, Tools, Standards«, the symposium offered the latest insights in Connected TV, Web Technologies, Internet of Things, Streaming Media and Multiscreen Solutions. Latest solutions in our lab and the exhibits of our event partners were demonstrated, too. According to the feed-back we have received so far, participants have experienced lots of interesting and inspiring conversations and debates at the event and enjoyed their stay in Berlin. Find impressions of the symposium at our MWS 2015 Gallery. 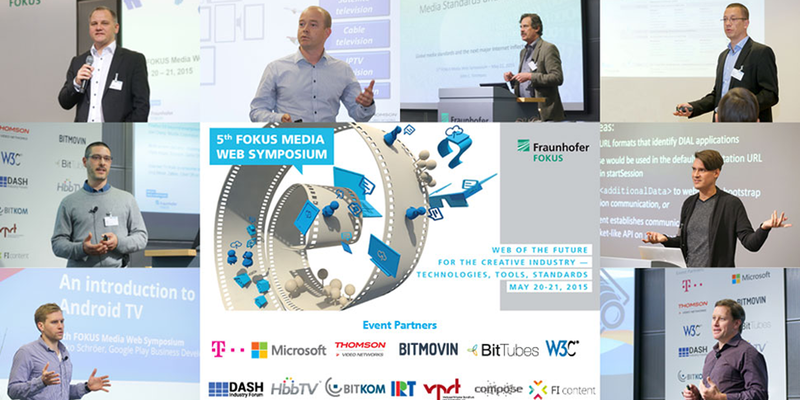 Fraunhofer FOKUS will be hosting the 6th FOKUS Media Web Symposium next year 2016. We would be delighted to welcome you to next year's event in order to exchange news thoughts, development and project ideas. We thank our event partners and look forward to our 6th FOKUS Media Web Symposium. If you want to take part in the 6th Media Web Symposium or if you are interested in our exhibition/sponsoring options please contact us. At IFA TecWatch 2015, September 4-9, 2015 in Berlin we will showcase our newest developments in the field of Smart TV Solutions, Web technologies and smart media services. Visitors learn more about our new solutions such as HbbTV 2.0 Application Creation Toolkit, HbbTV 2.0 Companion Screen Framework, Cloud based Monitoring of DVB-T/T2 networks, Dynamic Ad-insertion for broadcast and broadband environments. FAME will also exhibit at IBC 2015, September 11-15, 2015, Amsterdam. We will demonstrate our Open Content Decryption Module (OCDM) implementation updated to the latest Encrypted Media Extension (EME) Spec running on an RDK STB. At Medientage, October 21-23, München, we present our solution on HbbTV 2.0 Application Creation Toolkit, HbbTV 2.0 Companion Screen Framework, Cloud based Monitoring of DVB-T/T2 networks, Dynamic Ad-insertion for broadcast and broadband environments.